Sometimes kids find Bible stories difficult to understand because they don’t understand what life was like long ago. Look Inside the Time of Jesus addresses this problem in an engaging way with colorful illustrations and many intriguing flaps to peek under. 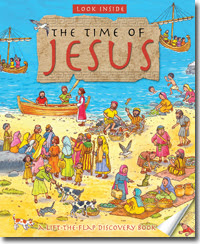 Beginning with Jesus’ birth, each two-page spread of this sturdy book illustrates everyday life in the context of the gospels. For example, “At Home in Nazareth” is about Jesus’ youth. It shows, behind a flap, a carpenter’s workshop. It also shows busy boys and girls at a school, at play, and at work, and portrays the synagogue where they would worship on the Sabbath day. On the other hand “Farm Country” alludes to several of Jesus’ parables, including the ones about the sower, the lost sheep, and the buried treasure. Fishing and farming, Roman soldiers, the Temple, and Jesus’ life and death are all illustrated in simple and clear pictures. The text supports the illustrations very well, but I did notice one inaccuracy. On the page about the Temple, Jesus is angry that a poor widow feels obliged to give; in the Bible he commends her. Other than that, Look Inside the Time of Jesus is careful to teach children commonly accepted views of the Bible. There are a satisfying number of flaps on each page, and they are carefully designed so that they open without difficulty or damage. Both the pages and the flaps are sturdy enough to withstand frequent rereading. By illustrating everyday life during Jesus’ earthly ministry, Look Inside the Time of Jesus clarifies the gospels and provides many opportunities for discussion. My five children would have enjoyed it between the ages of 3-10, although the target age is 5-7. 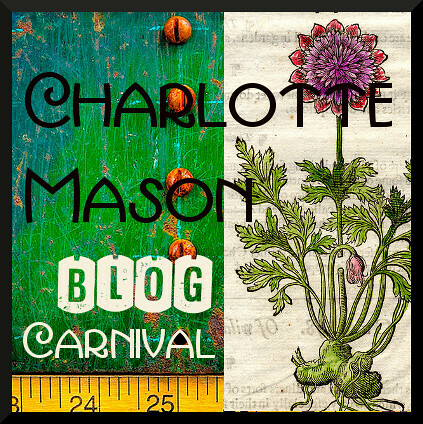 This review is linked to Works for Me Wednesdays, Booknificent Thursdays, Raising Homemakers. Disclosure: I received a review copy of this book from Kregel publications for the purpose of this review. All my opinions are my own, and I am not compensated for sharing them. 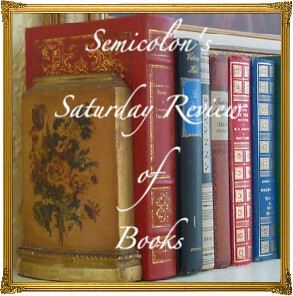 Posted in: Reviews, Reviews: Nonfiction, Reviews: Picture Books.